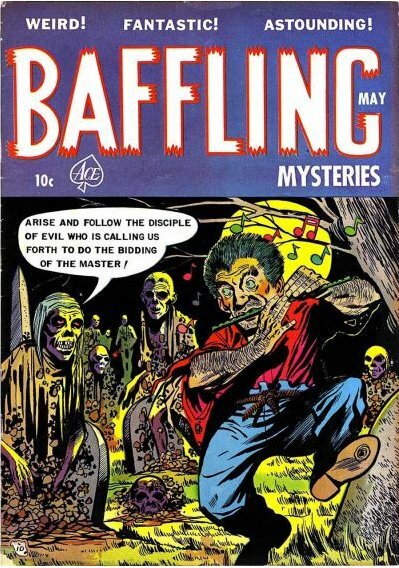 ACE MAGAZINES published several pre-code horror titles including BAFFLING MYSTERIES which lasted 22 issues from November 1951 – October 1955. 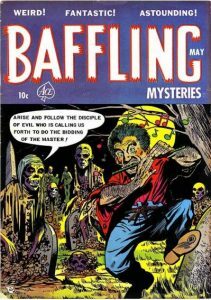 Artists included Jim McLaughlin, Charles Nicholas, Lin Streeter. 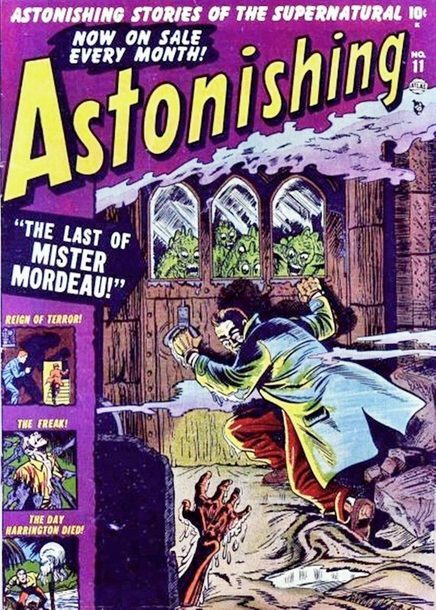 Known for the classic covers which depict someone looking at a painting or ancient drawing and saying “Why that couldn’t possibly exist!” Meanwhile said impossible creature, ghost, monster is lurking behind them. 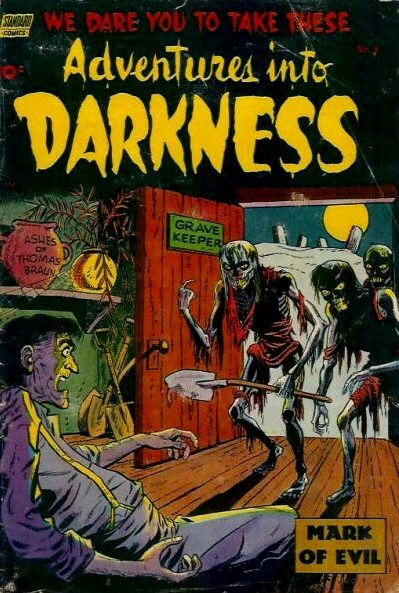 Some of the more tame horror comic books of the pre-code era, but with some snappy covers. 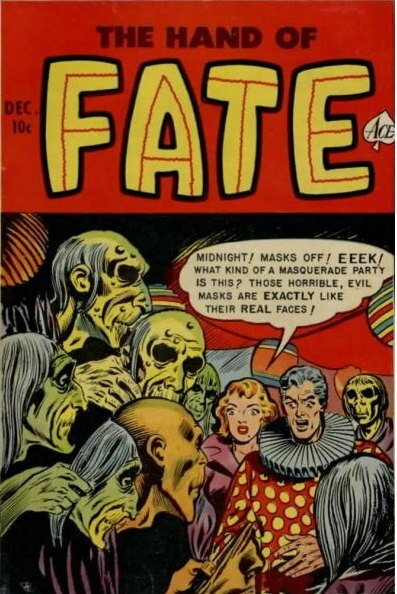 ACE MAGAZINES pre-code comic book title THE HAND OF FATE – 19 issues from Dec. 1951 to Dec. 1954. 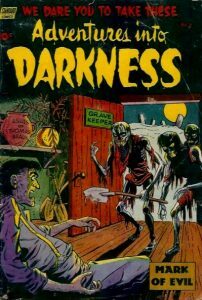 Next up in the pre-code line from ACE and less remarkable than THE BEYOND. Toward the end of the series, they brought in the “Fate” character on the covers as a kind of host. “What was that noise? OHH!” and other unintentionally hilarious dialog from WEB OF MYSTERY – ACE COMICS – 29 issues from Feb. 1951 to Sept. 1955. 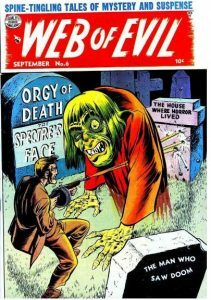 The cover for WEB OF MYSTERY #17 features the menacing witch head aka “Tunnel of Love” story is by Lou Cameron. Cameron was the artist for many of the Classics Illustrated series including adaptations of novels by Herbert George Wells, Ann S. Stephans, Alexandre Dumas, Emile Zola and Robert Louis Stevenson. 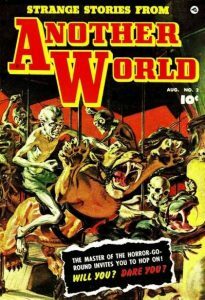 He did a lot of pre-code horror comics for ATLAS, ST. JOHN,DC and ACE. You can watch the Ace Magazines video here. 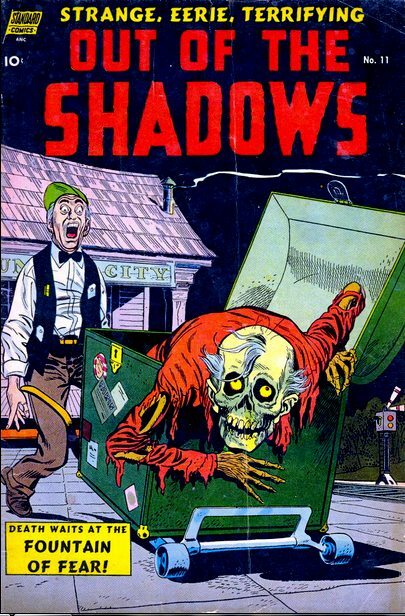 STANDARD COMICS presents OUT OF THE SHADOWS – 10 issues from July 1952 to August 1954. 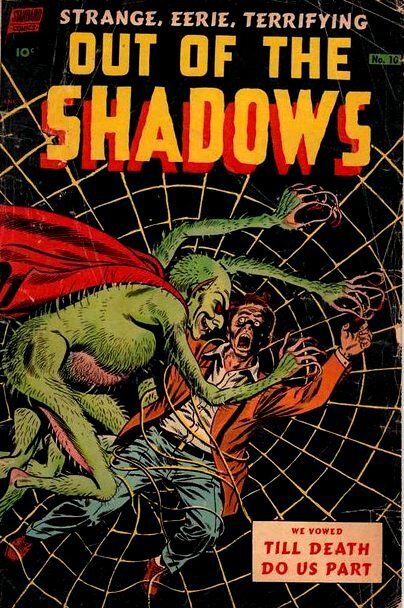 A ton of great artists did pre-code horror comics for STANDARD including Alex Toth (also known for animation designs for Space Ghost, Sealab 2020 in the 1960’s), George Roussos who penciled the great spider creature cover pictured here (he drew comics for EC as well), George Tuska, Vince Colletta and Jack Katz. Several of these issues are highly sought after and demand big bucks in the collectors’ world. 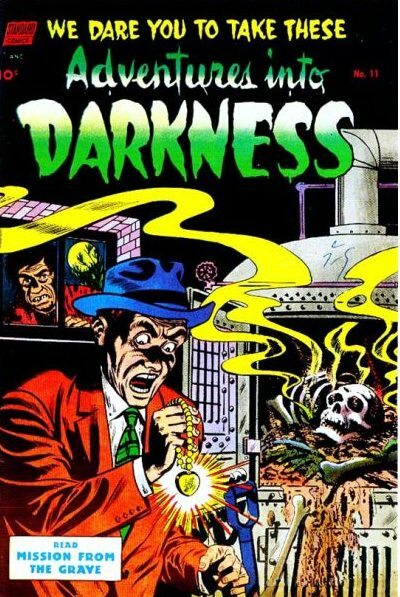 ADVENTURES INTO DARKNESS from Standard Comics – 10 issues from August 1952 to June 1954. 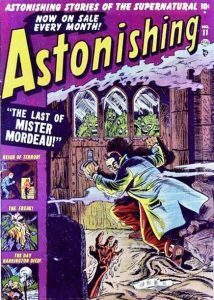 Standard employed some of the best artists from the pre-code era including George Roussos, Ross Andru, Mike Esposito, Jack Katz, Alex Toth, Nick Cardy and George Tuska, just to name a few. The awesome skeleton shadow cover (The Man Who Could Not Die) for issue number 10 was drawn by Ross Andru who is probably best known for his work on The Amazing Spider-Man comics from Marvel. 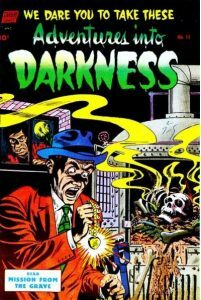 The stories in this series tended to be more classic horror in nature and we some excellent pieces of original art from some of the stories in Adventures into Darkness on ghostclinic.com. 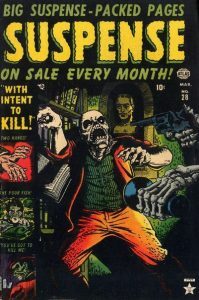 Standard Comics – 11 issues from June 1952 – July 1954. 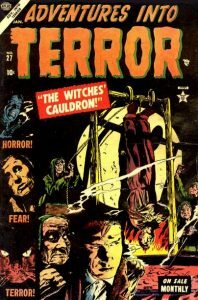 Featuring the usual lot of artists and writers from the other Standard horror titles such as Alex Toth, Ross Andru, Mike Esposito, Jerry Grandenetti, Abe Simon, Irwin Shapiro, Jack Katz, George Roussos. 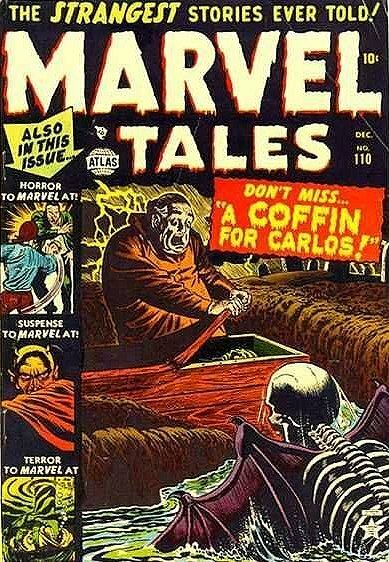 There are some great stories in this title and we’ll present some original art with the next post. 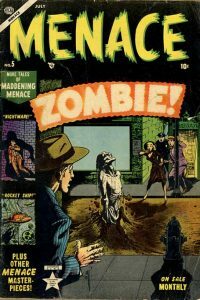 Some images and scans from Heritage Auctions and Comics.org. Watch the Standard Comics video. 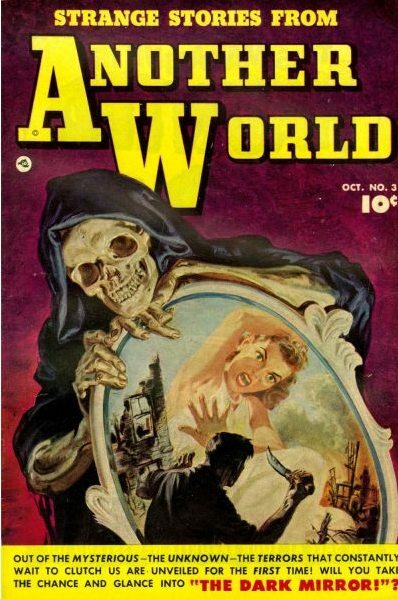 Featuring the gloriously ghoulish pre-code painted horror covers of Norman Saunders. 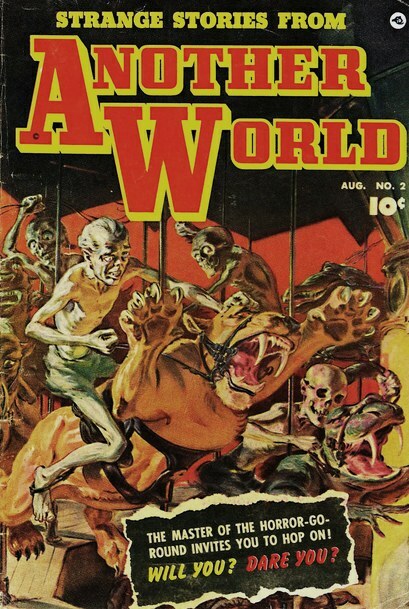 Fawcett – 4 issues from Aug 1952 to Feb 1953. 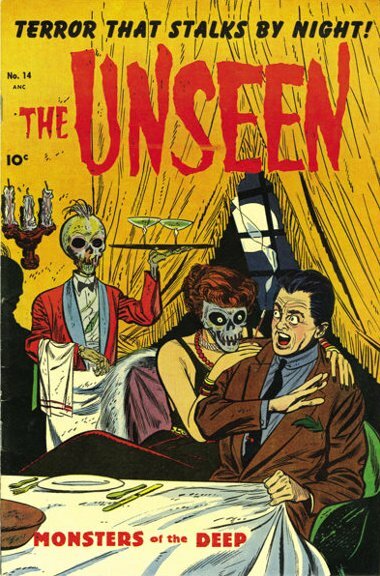 Pictured here are all 4 issues of this extremely short series. 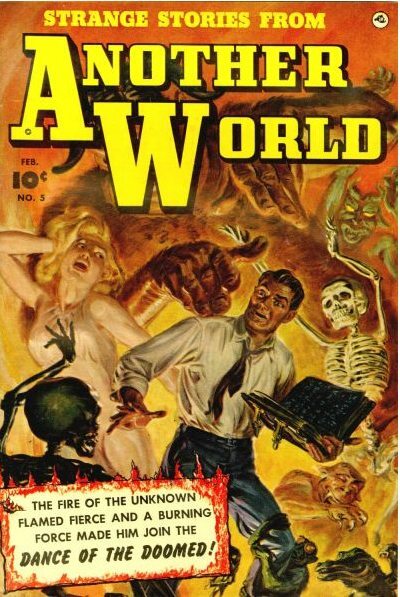 The outstanding feature of this title is that all the covers were painted by the great Norm Saunders (1907 – 1989) who was a successful commercial artist for decades, perhaps most famous for the wildly popular MARS ATTACKS trading card series which eventually spawned the movie of the same name directed by Tim Burton. 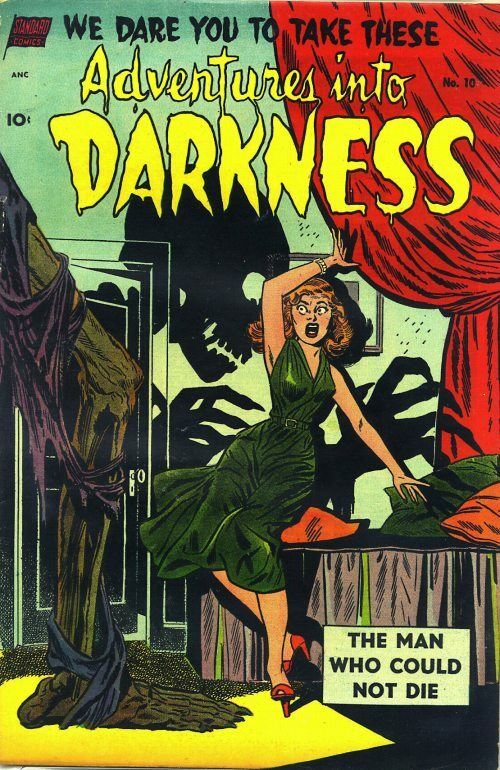 Thanks to the Grand Comics Database. 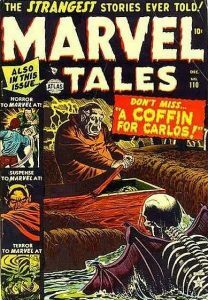 Quality Comics. 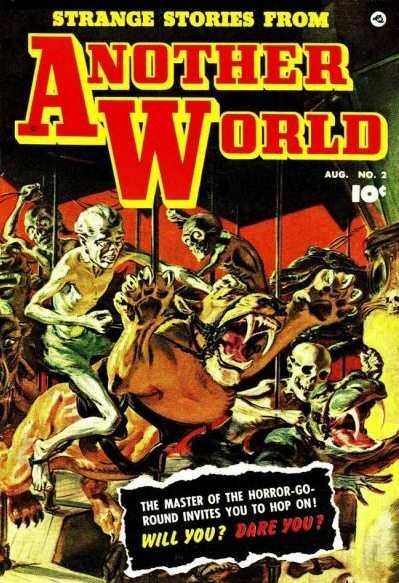 21 issues from 1952 – 1954. 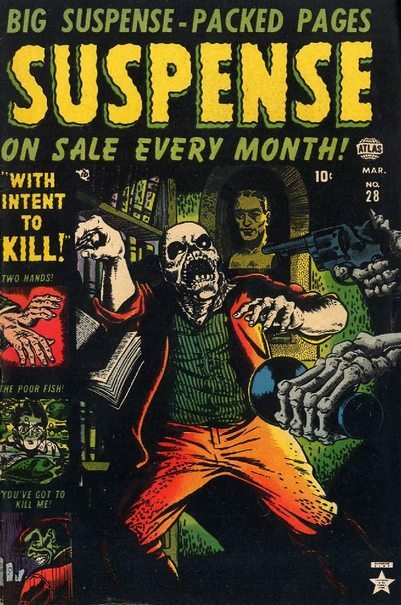 Quality Comics was famous for super hero titles like PLASTIC MAN, but when they got into pre-code horror comics, their go-to artist, JACK COLE ended up making some of the most sought after PCH comics in the collectors’ field today. 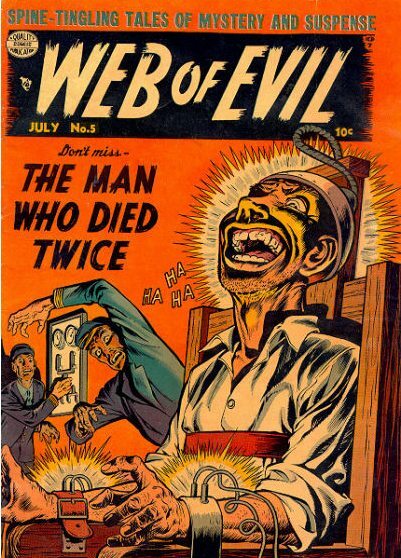 Cole’s electrocution cover for issue 5 is among the most popular covers, selling at hefty prices…if you can find a copy! 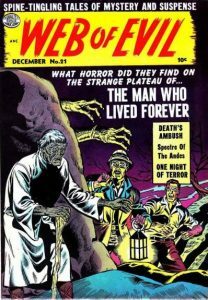 It is thought that Cole also wrote some of the stories in Web of Evil, and indeed this series supplied some of the best terror tales in the pre-code period. 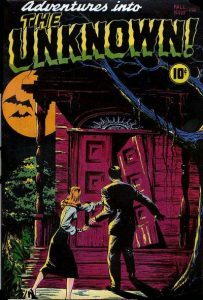 Check out VALLEY OF HORROR in issue #8, one of my personal favorites. 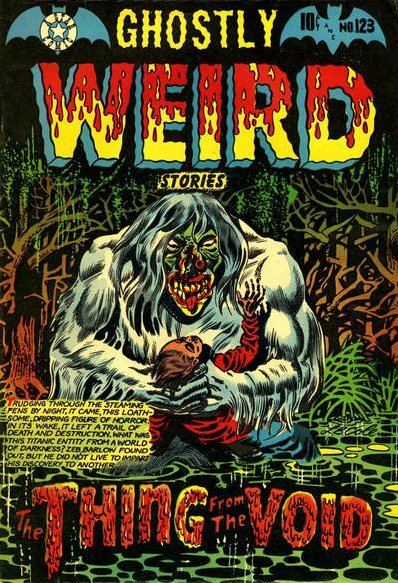 This story can also be found reprinted in FOUR COLOR FEAR from Fantagraphics and HAUNTED HORROR #5 from IDW. 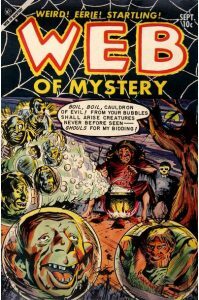 Watch the Web of Evil Video. 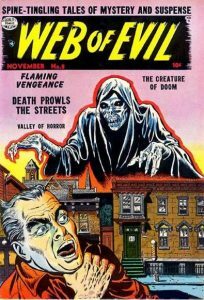 We finish our look at WEB OF EVIL with some of the latter issues in the series. By this time, the great JACK COLE was no longer doing covers (or much of anything) with the series, but it is interesting to note that REED CRANDALL, one of the greats from the EC Comics line who would eventually do a lot of fantastic stories for CREEPY and EERIE magazines (Warren Publishing) in the 60’s and 70’s, did the cover for issue number 14 pictured here with the title WITCH OF DEATH. Charles Nicholas was doing the lion’s share of interior art for WEB OF EVIL for the remainder of the series. 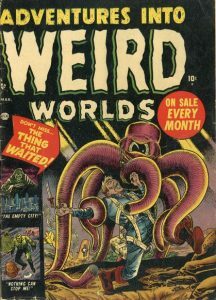 Many thanks to https://www.comics.org/ for additional pics and info. 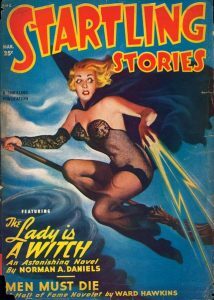 GHOSTLY WEIRD STORIES (5 issues from September 1953 – September 1954)German-born L.B. Cole’s Star Publications is mostly remembered for the amazing covers rendered by Cole himself and the stories drawn by British artist Jay Disbrow which were typically based upon Cole’s cover art. 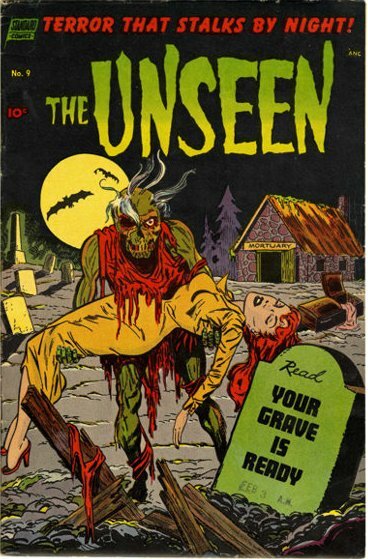 Unfortunately, most of the other stuff inside the comics were reprints from earlier titles, but L.B. Cole’s eye-catching covers still demand huge sums of money in the collectors’ market today. 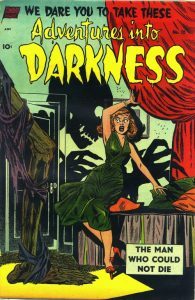 It is impossible to talk about pre-code horror comic books and not mention the great Norman Saunders (1907-1989). 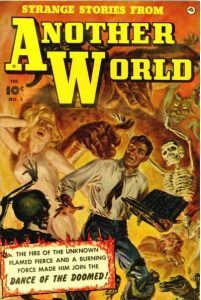 His contributions to the pulp magazines and comics of the 20th century are substantial, and he was one of the few artists who painted covers for comic books as seen with Strange Stories from Another World and Unknown World. Saunders also created many of the great scenes for Topps’ MARS ATTACKS trading cards. 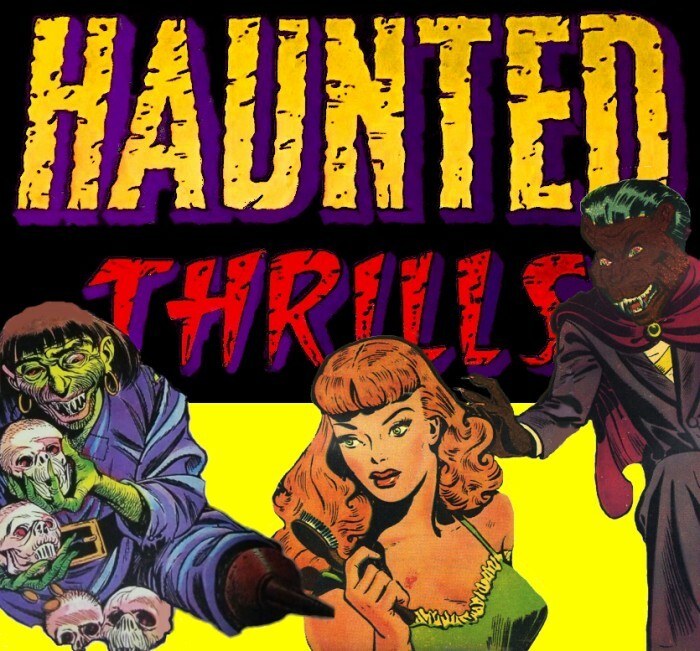 Ghost Clinic is pleased to present the first trailer for HAUNTED THRILLS (2019) a documentary by Mike T. Lyddon about pre-code horror comic books of the 1940’s and 1950’s featuring interviews with original pre-code artists Everett Raymond Kinstler, Joe Sinnott and Vic Carrabotta. 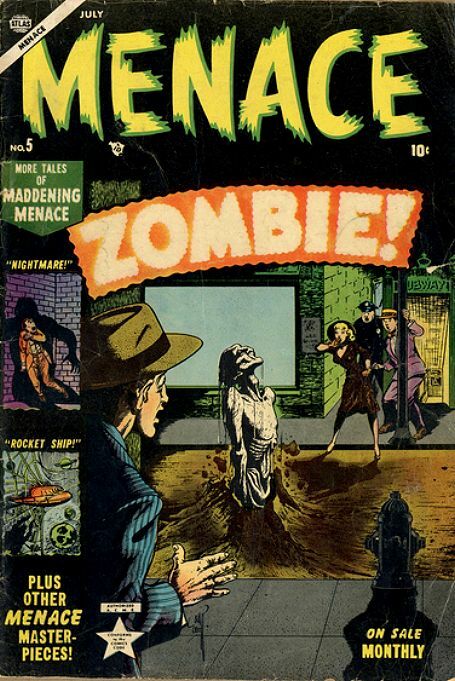 Also segments on Metropolis Collectibles / ComicConnect.com with Vincent Zurzolo and pre-code adaptations of Edgar Allan Poe stories with a trip to the Poe Museum in Richmond, Va.
Will be on the comic con and film festival circuit for the better half of 2019. 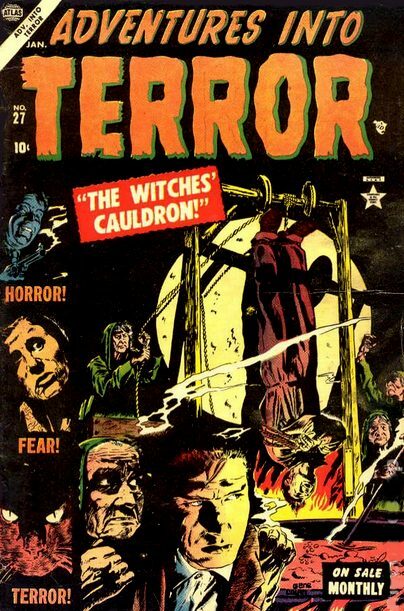 William Gaines famously declared that EC Comics were the first horror comics published. 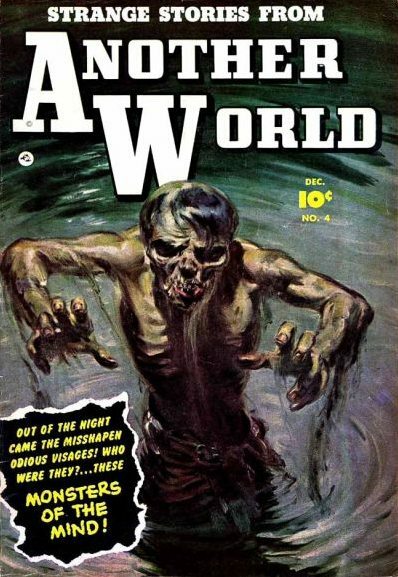 In 1947, Avon published a one-shot all horror comic book called EERIE, which would pick up again a few years later, and ACG started publishing ADVENTURES INTO THE UNKNOWN at the end of 1948, nearly a year before EC got into the game. It should also be pointed out that ATLAS Comics, helmed by Stan “The Man” Lee, already had a few issues of all horror comic books published before EC. 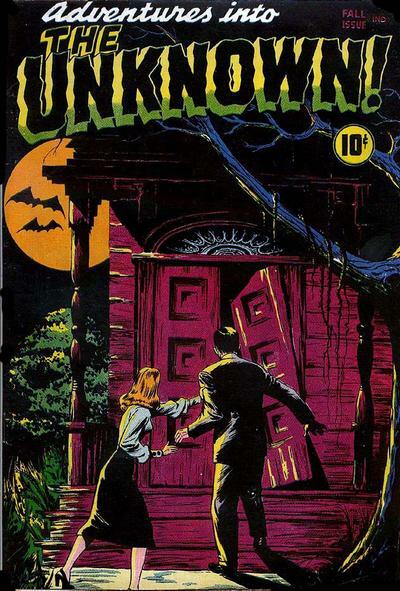 The best covers from ADVENTURES INTO THE UNKNOWN are from early issues drawn by the great Edvard Moritz. 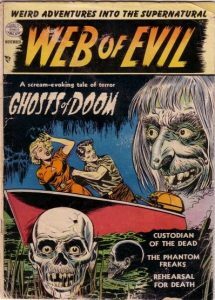 Enjoy this little animation we made for Ghost Clinic, featuring animated figures from pre-code sci-fi and horror comics of the 1950’s!